The Single Trade Union for Concierges (SUTERH, by its initials in Spanish) and the Buenos Aires branch of the Argentine Federation of Waste Pickers (FACyR-CTEP by its initials in Spanish) signed a solidarity agreement for a “cleaner and healthier city with formal and decent work”. On October the 3rd a meeting took place bringing together over 200 concierges and urban waste pickers. During the event both exchanged experiences and walked around the recycling plant to see in detail the classification process carried out by waste pickers. The aim of the agreement is to get concierges and waste pickers to work together on waste management in order to protect the environment. Some of the key points highlighted by the delegates were the formalization and labour market inclusion with full rights, decent work, good working conditions, training, recreation, retirement and the right to unionize. 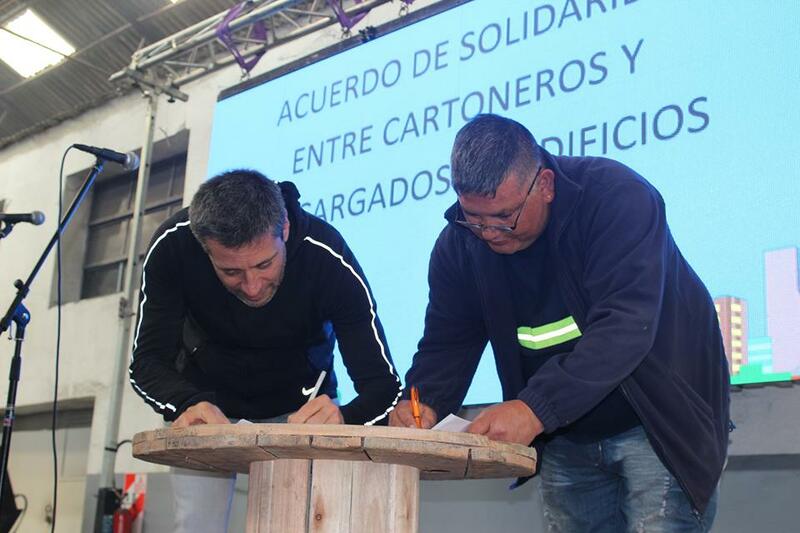 The signed agreement implies working on four main aspects: raising awareness; segregation at source; they agreed Zero Waste wouldn’t be reached without waste pickers’ participation, as they are the ones who know more about the situation of waste in Buenos Aires; and last, consensus was made on the fact that the market can´t be left in charge of environmental policy, we have to secure quotas and minimum trading prices and avoid thousands of tons of trash ending up in landfills. Watch video of the agreement.